Harrison County's diverse economy makes it an ideal place to do business. Our business friendly environment has a variety of industries that work together to advance the economic growth of the region. Beyond work, the quality of life in Harrison County is rich with opportunity. The scenic beauty, comfortable climate and the numerous parks and recreation venues of the region offer ample opportunity for relaxation and enough excitement for all outdoor enthusiasts. Enjoy cultural arts performances, savor the local cuisine in our fine dining restaurants, and visit historic landmarks, specialty shops and heritage festivals. 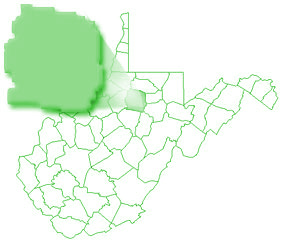 Harrison County was created from Monongalia County, Virginia, in 1784 and was named for Benjamin Harrison, a signer of the Declaration of Independence. It is located in the north central section of the state, 120 miles south of Pittsburgh, Pennsylvania, and mid-way between Cincinnati, Ohio, and Washington, D.C.
Clarksburg, the county seat, was originally chartered in 1785. It was named for Gen. George Rogers Clark, a renowned explorer and Indian fighter. Thomas "Stonewall" Jackson was born there on January 21, 1824. General Jackson fought for the Confederacy, although Clarksburg was a Union stronghold. According to the U.S. Census Bureau, the county has a total area of 417 square miles (1,079 km2), of which, 416 square miles (1,078 km2) of it is land and 1 square miles (1 km2) of it (0.13%) is water. The county is drained by the West Fork River and its tributaries, including Tenmile Creek, Simpson Creek, Elk Creek, and Hackers Creek. As of the census of 2010, there were 69,099 people residing in the county. The median income for a household in the county was $40,100. The per capita income for the county was $37,342.